Venkat talks about the days when he started SmartMegh. He decided that he wanted to get into the cloud business, but he also knew that it would be a long gestation period if he aspired to enter the product development space and hence chose to partner with companies that had a product in the cloud . The key thing is to have the right types of partnerships. There was no renowned cloud product at that point in time, a few of the companies were setting up their cloud presence. So, he explored a few cloud products that were available and chose Ramco because they had a consolidated ERP. He did not have any sales team at that point in time but depended on Ramco to give the leads. To do the implementation, he hired a few juniors and sent them to Ramco for training and he realized that there was an opportunity as they were getting trained. Ramco did not have a training module and he pitched that he will develop a training module for Ramco and got his first deal and still strengthened his relationship with the principal. Then came the first implementation reference from Ramco for a HCM opportunity. Ramco had done the primary groundwork and Venkat had to depend on Ramco for any pre sales support in the first few deals till he became self-sufficient. He also realized the ecosystems of partners in the market and found that he can differentiate himself by being a strong support partner and began investing in the support team and scaled. This got him larger deals from Ramco as they found him implementing the solutions much better. Now, with a few deals in hand, he invested in a sales team with a senior person running sales who built a sales and marketing structure for the company. Now SmartMegh has a Pan India presence and has also expanded to Middle East. They have partnerships with Ramco, Adaptive Insights, FreshDesk, NetSuite to name a few. They have 30 customers and the team is now a 60 member organization. 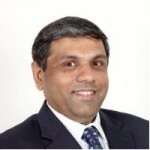 Venkat’s advice for start-ups who aspires to be in the services business. Align with a strong principal who will give you the support and get you the cash flow for your business in the early months. The money that you had saved when you started will vanish in no time and your spending should happen out of internal accruals which means that you need to have one customer doing business with you or have one partner who gives you the business and hence earn the money that you would need to spend. Alternately, the founders can sell themselves individually to do some consulting gigs, this will happen if the founders as employees, have created enough of a goodwill bigger than the organizations they were employed with so that customers begin trusting the founder and gives business.